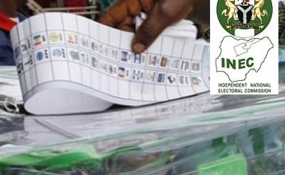 The Independent National Electoral Commission (INEC) has released the final list of candidates eligible to participate in the forthcoming general election. The list contains the names of candidates for the presidential, senatorial, House of Representatives and state Houses of Assemblies. The Social Democratic Party (SDP) did not present presidential candidate or running mate for the election, as two persons –- a former Minister of Information, Jerry Gana; and a former Governor of Cross River State, Mr. Donald Duke — are laying claim to the ticket. The youngest candidate is the 30-year-old Johnson Omede, a vice presidential candidate of the New Nigeria People’s Party. A total of 72 presidential candidates and another 72 vice presidential candidates are expected to run for the presidential election. Others whose names appeared on the list include President Muhammadu Buhari and Vice President Yemi Osinbajo, who are the candidates of the All Progressives Congress; former Vice President Atiku Abubakar, and former Governor Peter Obi of Anambra State who are the presidential and vice presidential candidates, respectively, of the Peoples Democratic Party (PDP). Others include Dr. Oby Ezekwesili of the Allied Peoples Movement of Nigeria (APMN); Mr. Omoyele Sowore of the African Action Congress (AAC); Mr. Kingsley Moghalu of the Young Progressives Party (YPP); Mr. Sina Fagbenro-Byron of the KOWA Party; and Mr. Fela Durotoye of the Alliance for New Nigeria (ANN). Others include Mr. Obadaiah Mailafia of the African Democratic Congress (ADC); Mrs. Eunice Atuejide of the National Interest Party (NIP), among several others. Meanwhile, INEC in Rivers State has finally released the list of presidential, senatorial and House of Representatives candidates with the exclusion of candidates of APC in the state. While the list contains details of candidates of PDP , Accord Party, Labour Party, Social Democratic Party and Green Party of Nigeria, among others, those of the state APC were conspicuously missing. The reason, it was gathered, was because of the court ruling asking INEC to remove Rivers APC candidates from the list of persons running for the general election. Recall that the State Resident Electoral Commissioner, Obo Effanga, had maintained that INEC would abide by the directives of the court since it was a creation of the law. Effanga had told our Correspondent while responding to an order by a Federal High Court that INEC should expunge the names of APC candidates in the state from its list ahead of the 2019 elections. The state REC had stated that the Commission would not hesitate to do anything it was ordered to do by the court.